Buy Smalts Paint for sale here. Smalt is sprinkled over wet oil base enamel paint mixed with a Smalt Cream call Smalt Paint. Smalt paint is very thick and dries slow, this allows time for the Smalt to sink in and embed into the Smalting Paint. Smalted Signs have a rich texted sparkle that if applied correctly, looks like a rough furry surface. 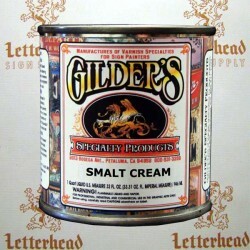 Smalt's Paints based main ingredient is Smalt's Cream and the best Paint to use is Ronan Lettering enamel. The other brands are mainly poly urethane's that dry to fast and have shorts lifespans.